The oil-rich country, a key departure point for some of the thousands of migrants travelling to Europe, once had one of the highest standards of living in Africa, with free healthcare and free education. But the stability that led to its prosperity has been shattered and the capital, Tripoli, is now the scene of serious fighting between rival forces as negotiations to build a post-Gaddafi Libya stall. Only Libya’s myriad armed militias really hold sway – nominally backing two centres of political power in the east and west with parallel institutions. This is under the leadership of Prime Minister Fayez Sarraj, an engineer by profession. He arrived in Tripoli in March 2016, four months after a UN-brokered deal to form a unity government, to set up his administration. Over the last three years he has worked to gain the support of the various militias and politicians, but he has little real power over the whole country or of the forces ostensibly under his control. When those who held power in Tripoli refused to give it up in 2014, the newly elected MPs moved to the port of Tobruk, 1,000km (620 miles) away, along with the old government. In 2015 some of these MPs backed the UN deal for a unity government, but the parliament has since refused to recognise it and has been blocking efforts to organise fresh elections because it wants military strongman Gen Khalifa Haftar, who leads a powerful force called the Libyan National Army (LNA), to be guaranteed a senior role in any new set-up. Some go as far as to suggest that Gen Haftar has ambitions to be “the Sisi of Libya”, a reference to Gen Abdul Fattah al-Sisi, who seized power in neighbouring Egypt. And it is guns that matter. Some security analysts describe Libya as an arms bazaar. 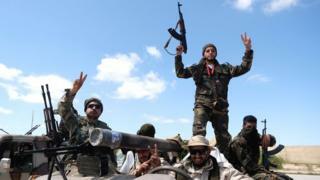 It is awash with weapons looted from Gaddafi’s arsenal and from allies in the region supporting rival factions. Militia allegiances often shift out of convenience and with the need to survive. Weren’t they all once allies? They were united in their hatred for Gaddafi – but nothing more. There was no single group in charge of the rebellion. Militias were based in different cities, fighting their own battles. They are also ideologically divided – some of them are militant or moderate Islamists, others are secessionists or monarchists, and yet others are liberals. Furthermore, the militias are split along regional, ethnic and local lines, making it a combustible mix. And after more than four decades of authoritarian rule, they had little understanding of democracy. Former US President Barack Obama, in an interview published in April 2016, said that the “worst mistake” of his presidency was the failure to prepare for the aftermath of Col Gaddafi’s overthrow. He helped Col Gaddafi seize power in 1969 before falling out with him in the 1980s and going into exile. He returned amid the uprising against Gaddafi to fight against his former boss – and in the aftermath cast himself as the main opponent of the Islamist militias in eastern Libya. For three years he battled various Islamist militias, including groups aligned to al-Qaeda, in the eastern city of Benghazi. However, his critics accused of him of labelling anyone who challenged his authority as “terrorists”. After taking control of Benghazi, he then set his sights on the top job, but the main bone of contention has been a clause in the UN-brokered agreement that prevents a military figure taking political office. Observers say Gen Haftar’s appearance at a series of talks in France, Italy and United Arab Emirates (UAE) was more about establishing himself on the international stage than finding common ground. This January his forces launched an offensive to seize two southern oil fields. He is now believed to control most of Libya’s oil reserves. Does he have international backing? Yes, he has long had the support of Egypt and the UAE – and made a visit to Saudi Arabia a week before he launched the offensive on Tripoli. Gen Haftar has made several trips to Russia, been welcomed on a Russian aircraft carrier off Libya, and on Sunday Russia vetoed a UN Security Council statement condemning his advance on Tripoli. France, which has taken on a mediation role, has denied taking sides despite suspicions about its relationship with the general. French Emmanuel Macron was the first Western leader to invite him to Europe for peace talks, and France launched air strikes in support of Gen Haftar’s forces in February. They targeted Chadian opposition forces fighting against the LNA in the south. Most Western nations back the unity government. Since the offensive on Tripoli, the UN, the US and the EU have all called for an immediate halt to the fighting and for talks. Analysts say Gen Haftar may have made his move because the UN announced a “national conference” in the Libyan city of Ghadames, to take place between 14-16 April, to discuss with local communities a road map for elections. With more territory under his control, Gen Haftar may feel he has a stronger hand at any negotiating table. Like everything in Libya, it is difficult to tell, but over the past year voices in western Libya have spoken out in support of him. Some there are fed up with the insecurity, weak governance and the corruption amongst powerful militias who control the capital and feel a strong man may be able to bring some authority to the lawless nation. More recently, Gen Haftar has been able to lure some armed brigades and tribes, particularly in the south, to fight with him and has found some strategic armed allies in smaller towns in western Libya. Is the Islamic State (IS) group a factor? The turmoil that followed Gaddafi’s fall allowed IS to gain a foothold in the country, taking control of the former Libyan leader’s home city of Sirte. But armed groups from the city of Misrata and the central region, which are at times loyal to the unity government, managed to expel the fighters from the city in August 2016 – with Western backing and US air strikes. IS, which was made up of defectors from local jihadist groups and foreign fighters, does not now control any city or town but still has a presence in various desert hideouts. It is now a diminished force, though it has been behind some attacks in the capital, further undermining security. Who are the main militias? Gen Haftar’s self-styled Libya National Army (LNA), which has launched an offensive on Tripoli in April, is made up of former army units and militias loyal to them and has the backing of the Tobruk-based government. Its main base is in Benghazi in the east, where it defeated Islamist armed groups, but it has the support of tribal groups in the south and other conservative Salafist militias. Tripoli’s many militias tend to co-operate but there has been fierce infighting on occasion as their allegiances shift. The UN has tried to assist the government by mediating “security arrangements” to bring them into the fold. The biggest group in the capital is now the Tripoli Protection Force. It was formed in December 2018 and is made of four key militias: the Tripoli Revolutionaries, Abu Salim Central Security Forces, the Nawasi Battalion and the Special Deterrence Forces. Some groups in Tripoli, like the Salah al-Burki Brigade, have refused to accept the authority of the GNA. But they are likely to take up arms against Gen Haftar given their support for the old Islamist-dominated parliament that was in power in the capital between 2014 and 2016. A senior Syria-based al-Qaeda cleric has also called on jihadists to fight Gen Haftar’s forces. Powerful militias from neighbouring Misrata, such as the 301st Brigade, which were instrumental in the fight against Col Gaddafi and then IS, have also dispatched forces to Tripoli in the wake of the LNA’s advances. Towns around Tripoli also have their own militias – one powerful group is the Tarhuna 7th Brigade, based south-east of the capital. It has attacked Tripoli in the past but is officially affiliated to the GNA, which has now formed a joint operations room to co-ordinate the militias wishing to defend Tripoli against the LNA. How is life being affected? The current fighting threatens to further disrupt oil supplies and fuel migration to Europe. The cost of living is expensive in Libya, though there has been a crackdown on the black market which had caused prices to skyrocket a few years ago. Inflation has improved, but hospitals are still in short supply of medicine. People do not feel safe and are constantly on the edge. Women especially feel more threatened when they go out – and kidnappings for ransom are still a threat. It is not easy to travel around the country as ID cards can identify which area people are from – and more than 170,000 Libyans are internally displaced, according to the UN.